We’ve got a couple new features that you might find useful. The focus this time has been on improving communication with buyers and sellers. 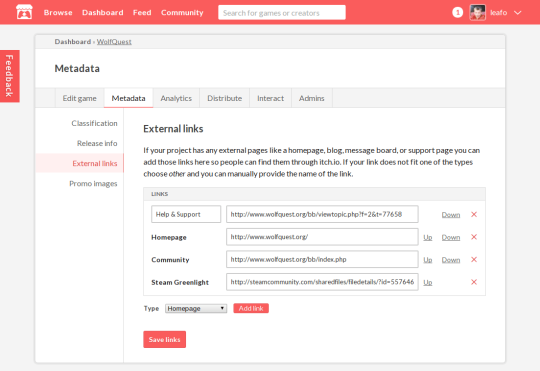 If you have any related URLs for your projects, like support pages, homepages, or external communities, you can now add these from the External links section of the distribute tab. These links will automatically appear on the top of every game download & purchase page. They will also show up on the purchase confirmation page that is sent to every buyer. In the future we may add them to a few more places as well. If you’d like to add the links to your project pages we recommend inserting them manually into the description for the time being. itch.io does not share your account’s email address. This is great for privacy, but not always ideal if want to give your customers an easy way to contact you. From the account settings page there’s a new Support email section that lets you provide us with an email that we’ll share if someone who bought your game needs support. When someone visits our support page, any projects they’ve interacted with that provide support information will be listed. The “Report project” dialog will list support contact information to help prevent any frustrated players from contacting us the wrong way. The purchase confirmation email will have the Reply-to field set to your support email. We have a new guide page designed for buyers explaining in detail what happens after you buy something. We’ve noticed a few people get confused regarding accounts and how purchases work. Hopefully this clears up any confusion, and feel free to share this page with your customers if they’ve lost the link to a purchase. “Anonymous buyers” are people who buy something on itch.io without registering an account. In the past, if one of these buyers goes back to the project page after they’ve bought it they would see the buy button again. This was quite confusing for a few folks since there was no indicator that own the item. We’ve pushed out an update that will give anonymous buyers a special session that will show the “You bought this” screen as if they had an account. We also still encourage all buyers to create an account to manage their purchases. If you’ve provided any installation instructions for your project, they’ll now appear on your purchase confirmation email sent out to every buyer after they complete their purchase. If there’s anything you want to make sure a buyer reads before trying to install and run your game, put it there. That’s all for now, if you have any ideas to help improve developer/creator communication feel free to send us a message.